Learn how to repair scratches on your sunglasses. 3 How Do I Repair Scratches on an Oakley Sunglasses Lens? Sunglasses not only protect your eyes from direct sunlight but can be a stylish addition to any wardrobe while you're enjoying outdoor activities. 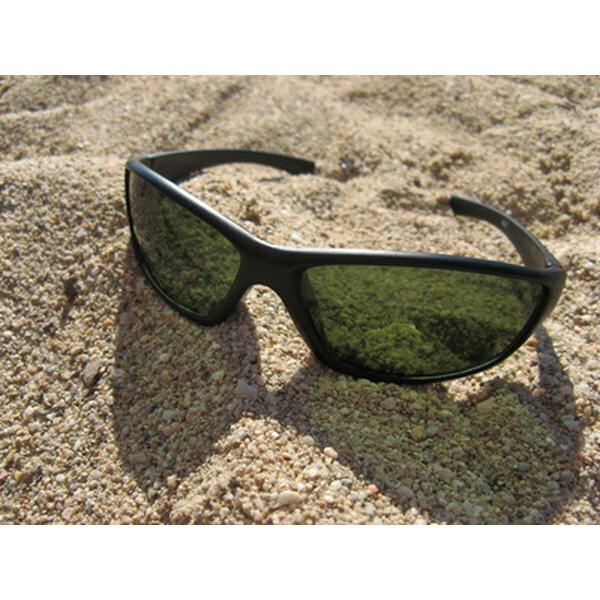 Today most sunglasses lenses are made from plastic, so it’s easy for them to develop scratches. It's not good for your eyesight to wear sunglasses with scratch lines running through your field of vision, especially if they're prescription lenses. Fortunately you don't need to purchase replacement sunglasses due to a scratch or two, since most of the time, scratches can be repaired using products found right in your own home. Rinse the lens of your sunglasses with hot water and soap to remove any dirt and residue. Wrap plastic over the frames of the glasses if you wish to protect them from the water. Spray wood cleaner that is used for polishing wood surfaces onto a clean microfiber cloth, and wipe it over your scratched sunglasses lens. Wipe the wood cleaner off with a lens cleaning cloth. Repeat two or three times until all the scratches are removed. Wash the wood cleaner off with hot, soapy water and allow to dry. Massage a small amount of petroleum jelly over the scratches in your sunglasses. Petroleum jelly will coat the scratches and help to fill in the crevices. Remove the petroleum jelly with a lens cleaning cloth. Use your fingers to rub a small amount of cigarette ashes into the cracks of the scratches. Rub for a few minutes, and repeat at least two times to remove the scratches. Wipe off with a lens cleaning cloth. Put a little baking soda into a small bowl, and add enough water to make a paste. Rub the mixture into your scratched lens with a clean microfiber cloth, using a circular motion. Wipe the baking soda off with a lens cleaning cloth. Squeeze a small amount of toothpaste onto a clean microfiber cloth and gently massage it into the scratched lens of your sunglasses. Rinse the toothpaste off with soap and water. Do not try to repair scratches on glass lenses. Scratches cannot be removed from glass lenses. If you try to treat glass lenses, you can destroy the glass. If you develop scratches in glass sunglasses, you'll have to replace the entire lens. Thoroughly wash off any of the ingredients you use on your sunglasses to repair scratches since you don't want them to come into contact with your eyes.